Volume 2, Number 6 of Boom! 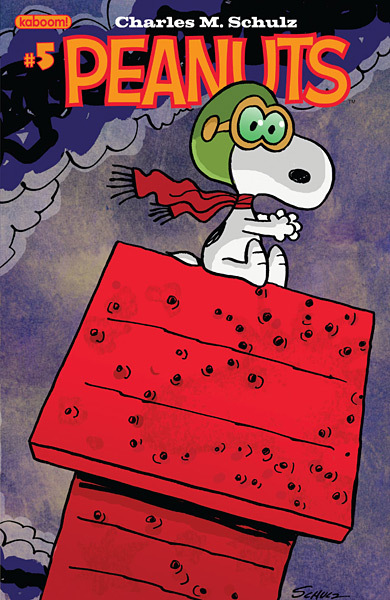 Studio's Peanuts comic book arrives Wednesday, February 27, 2013. The stories in this issue are "Dress for Success," "Mona Lucy," and "Restaurant Wars." As always, a preview is at Comic Book Resources . 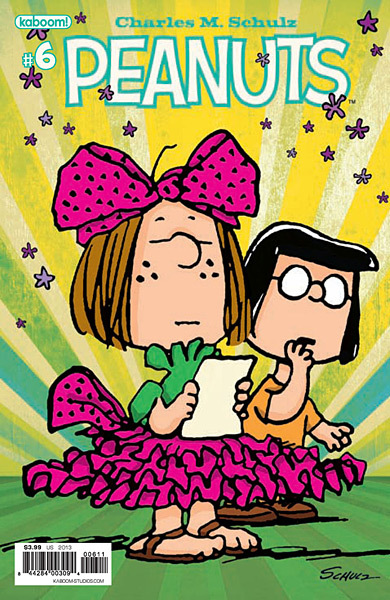 You can buy this issue at your local comic book store (consider setting up a subscription or standing order for the Peanuts comic if you're having trouble finding it), or order it from Boom! Studios' website. Just a reminder that Be My Valentine, Charlie Brown and A Charlie Brown Valentine will air back-to-back on ABC from 8 - 9 PM (Eastern/Pacific) on Saturday, February 9. Update: if you missed the shows on TV, you can watch them on-line at on hulu.com or ABC.com . After a two month break, Boom! Studio's line of Peanuts comic books resumed publication a couple of weeks ago. Peanuts Volume 2 Number 5 was published on January 23, 2013. It features the new stories "Adventures of the Flying Ace: Behind Enemy Lines," "Crabby New Year," and "Dirty for a Day," together with several classic Peanuts Sunday strips. Comic Book Resources has the usual six-page preview of the book. I apologize for being late with this news; my usual sources failed to alert me to the comic's release. Unfortunately, based on my personal experience, it may be difficult to find Peanuts #5 at your local comic book store as it's been two weeks since the book was published. The issue can still be ordered directly from Boom! Studios, though. Looking ahead, if your comic book shop offers a subscription service (and most do), it may be wise to sign up for it, in order to reserve future issues of the Peanuts comic book. Unlike the first time the Peanuts comic book took a break, this time Boom didn't restart with issue #1 again - thankfully, as it was already confusing enough to have two different issues labelled #1, #2, etc. So be on the lookout for issue #6 in two to three weeks... I'll try to announce it in a more timely fashion!